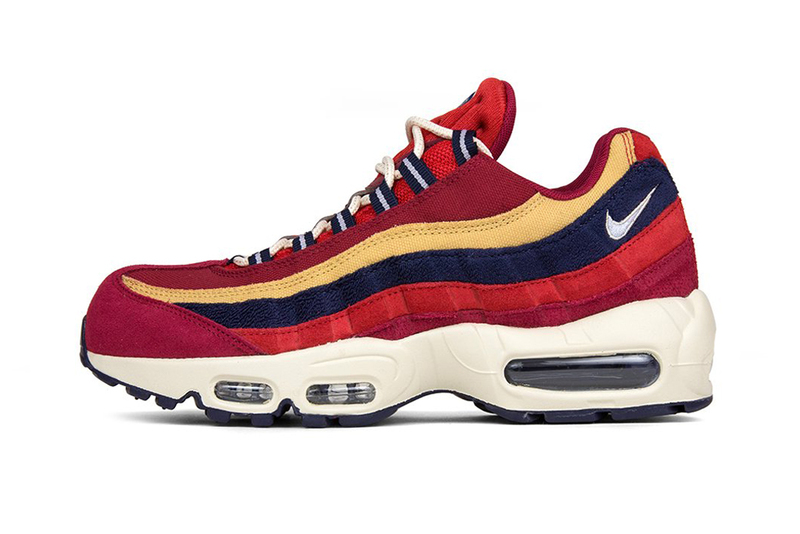 Having most recently teased a brown and blue colorway, Nike’s Air Max 95 Premium now receives a “Red Crush” makeover. Here, the iconic runner comes dressed in a mostly red-colored upper that mixes materials like suede, nubuck and canvas. The model’s signature wave-like stripe panels also appear in two contrasting hues of “Wheat Gold” and “Provence Purple,” while the midsole-outsole combo comes in tan and the aforementioned purple. The Nike Air Max 95 Premium “Red Crush” is available for $170 USD at both Nike.com and Feature Sneaker Boutique. For more from the Swoosh, here’s the official store list for the Nike React Element 87. Nike Air Max 95 Receives a Dash of "Habanero Red"
Nike Brings Back Jacob Burris' Air Max 95 "Doernbecher"
New vibes from Childish Gambino, Clairo, Ibeyi, Jorja Smith, Kaytranada and more. Only available at the brand’s new Harajuku Meiji-Dori outpost in Japan. The luxe outerwear label gets inspirational.